Amano shrimp (Caridina multidentata, Caridina japonica, Japanese shrimp, algae shrimp) is a very active though quite peaceful shrimp – it is one of the best and most useful shrimps for keeping in a tank. Japanese aquascapist Takashi Amano was the first to use these shrimps in his nature aquariums. Since 2003 Amano shrimp has become popular all over the world and millions of aquarists fancy them. Amano shrimp wild habitat is in the South of Central Japan, in South China and recently it has been found in Taiwan. These shrimps inhabit in clean freshwater rivers and streams flowing from the mountains into the ocean. Seawater plays quite special role in shrimp life cycle. The thing is that only adult Amano shrimp dwells in freshwater bodies, but shrimp larvae hatches in sea and feeds on sea plankton. When the larvae grows a bit, it comes back to the freshwater rivers. This is actually the reason why shrimp breeding in tanks has several difficulties. In 2006 due to some new studies of Japanese shrimps it was determined that Caridina japonica shrimp (discovered and described in 1892) and Caridina multidentata shrimp (described earlier in 1860) – are one and the same kind. Thus, since 2006 the name of Amano shrimp was officially changed to «Caridina multidentata». Takashi Amano, a famous aquascapist and designer of so called “nature aquariums” was the first to use these shrimps to deal with algae in his planted tanks. After revealing their remarkable ability of eating algae, he ordered several thousands of the shrimps from the local seller. Since 1980-s aquarists started to call this shrimp “Amano shrimp”. Amano shrimp size is larger that that of a cherry shrimp. Males are 1.5 inches large (3-4 cm), female shrimps are 2 inches large (5-6 cm). Coloring is transparent in general with tiny red-cinnamonic spots (about 0.3 mm in diameter). Depending on the shrimp diet the color of its body may vary. For example, if shrimp feeds mainly on algae and detritus, they have greenish tint. However, when feeding the shrimp with only with fish food they get reddish coloring. At that shrimp has an amazing ability of masking in a tank. If your shrimp has decided to hide, it’ll not be easy to find it. There are some cases when owners when being sure that all the shrimps in the tank died, start washing it and after draining all the water from the tank, they surprisingly find all the shrimps safe and sound on the tank bottom. By the way, here is an advise in this respect – if you want to find the shrimps hidden in the tank, direct the flash light onto the tank bottom at night – the shrimps eyes will reflect the light and shine brightly. Amano shrimp lifespan is about 2 or 3 years. Unfortunately, sometimes they die right after being bought, but this is due to the stress and change of tank conditions. Tank water temperature optimal for Amano shrimp is 73-82°F (23-27°С). However, the shrimp can live at 86°F and they easily stand tank water temperature decrease up to 60°F (14-16°С). Though at high temperatures the shrimp metabolism rate rises and it causes faster aging. Tank water рН may vary from 5,8 to 7,0. If tank water рН value is higher than 7.5 and there is lack of oxygen, shrimp doesn’t feel well and tries to get out of the tank water. Unlike other shrimps, Caridina multidentata shrimp isn’t very sensitive to ammonia content in the water. You can keep about 20-25 shrimps in a tank of 20 gallons capacity which is thickly planted and has small grained bottom. Amano shrimps like company of their kind. So if you keep more than 10 species in a tank, you’ll be able to observe how interestingly they cooperate with each other. Amano shrimps, especially females, will be very glad to find some shelters in the tank – snags, small branches, tank plants with large leaves will do perfectly well. Female with eggs is very attractive for active male shrimps and they haunt them rather aggressively. Therefore, you should provide the female shrimps with ability to hide somewhere from their obstinate admirers. Tank plants with small leaves will look nice and appealing as well. Java moss, Monosolenium tenerum, Egeria densa, Riccardia chamedryfolia, Cladophora are a good choice of plants for shrimp tank. These shrimp feature translucent bodies with a bluish tint, covered in small, dark red dots. Grows larger than any other dwarf shrimp in the hobby. The amano shrimp we send range from 1/2 to 1 1/2 inches in length. These plants are an ideal place for small tank dwellers to hide and they accumulate food for them as well. Lots of suspended particles, mud, food leftovers settle there and then become home for algae. Amano shrimps, especially young ones love eating all above mentioned food. Java moss creates perfect conditions for microorganisms to live (those that feed on bacteria). Water Sprite will be another good choice for such a tank as well. This plant isn’t demanding as for the tank lighting and its root system is very similar to that of the moss. Amano shrimp is peaceful (though still it’s better not to keep them with shrimps juveniles). The shrimp feels comfortable in a common tank, however they may become a prey for some large fishes. Therefore, you shouldn’t keep them with any Cichlid fish (as well as with angelfish, especially if Amano shrimps are little), with large catfish. Amano shrimp gets on well with any small sized peaceful fishes, since they are peaceful themselves, too. However, when feeding they may steal food from each other and other fishes, which looks rather funny. Nevertheless, you should still keep an eye on them and make sure that every shrimp gets enough food. Amano shrimp is compatible with the following fishes: betta, tiger barb, bristlenose fish, even with discus fish, though the latter requires higher tank water temperature, than that for the shrimps. Grows larger than any other dwarf shrimp in the hobby. The amano shrimp we ship out range from 1/2 to 1 1/2 inches in length. It was shrimp diet that made it such popular among aquarists. Takashi Amano kept them in his tanks due to their ability to eat algae, which didn’t let him create his perfect aquascapes. Amano shrimps perform their very important job faultlessly. They eat Green thread algae and other algae on tank plants, moss, tank decorations. The shrimp uses its small legs with tiny “fan-jig-saw” to cut a piece of Green thread algae, eat it and then cut another portion, this way releasing the tank owner from the routine job of keeping the tank clean. In fact, Amano shrimp together with otocinclus is the only way to fight Green thread algae actively in an aquascape. Attention! Amano shrimp doesn’t feed on black beard algae (BBA)! The main task of this shrimp in the tank is to eat Green thread algae. That’s why don’t expect to get rid of black beard algae once you put about dozen shrimps in the tank. Moreover, even a hundred of hungry Amano shrimps is quite unlikely to help you in this case. Well, they will nip black beard algae from time to time, but eating it completely – never gonna happen! Besides, Amano shrimp rather efficiently eats fish food leftovers, especially if you keep some gluttonous fish in the tank. Don’t forget to give the shrimps some additional food, especially if there isn’t much algae and detritus in the tank. Amano shrimp is a rather large one and it should have a proper diet. 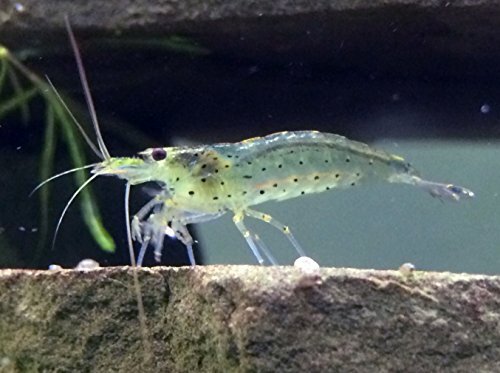 Amano shrimp food is specialized food for shrimps, vegetables like cucumber or squash, flakes, pellets, live and frozen food. In general, the shrimps isn’t demanding as for the food, despite the fact that you should buy food with high content of dietary fibre. Nowadays there are lots of specialized food for shrimps on sale in pet shops and on Amazon.com as well: Fluval Shrimp Granules, Hikari Shrimp Cuisine, Shirakura Baby Shrimp Food. Japanese shrimp can feed on dead fish, snails and other shrimps. Also one says, that they are capable of eating juveniles, which is quite possible in general. The shrimp likes spending its time on bulbs of moss or on sponges of internal water filters. In this case they feed on fish food leftovers and detritus, they don’t eat moss. Females have their first line of spots on the abdomen transferred into small lines, but male shrimps still have spots there. Male is smaller than a female, it is about 1.5 inches large (3,5-4 cm). The female shrimp grows to become a little larger – up to 2 inches (4-5 cm). If you see not uniformly spread red-cinnamon round spots on the shrimp body sides – this is definitely Amano shrimp male. Mature Amano shrimp female has pronounced egg nest (they carry and incubate their eggs in them) and long pleopods on its abdomen. These shrimps actively mate in the tank and female shrimps carry “begs” with eggs on them. According to approximate calculations, the number of eggs each female shrimp may carry varies from 2 to 4 thousands. The female shrimp carries eggs for 2 and up to 6 weeks. During this period it tries to stay at spots with high oxygen content, it cleans the eggs regularly and puts them from one to another egg nest. Right 3-4 days before hatching the eggs change their color – it becomes obviously brighter. The female shrimp throws away not fertilized or dead eggs right away. If everything is ok and the time has come, you should put the female shrimp into a separate volume the same conditions and there the eggs will hatch and small larvae appear. Amano shrimp juveniles are tiny, less than 1 mm large. It is clearly seen under microscope that the juveniles start feeding actively from their first day of life – they eat various microorganisms and even dry food for fish. Amano shrimp larvae have positive phototaxis, which means they get into the light very soon and this peculiarity can be used when feeding them. At that they are omnivorous – they eat everything starting from dry food for juveniles to ordinary brewers yeast (a crumble of yeast is stirred in a glass-tube and dug into the tank bottom, where there are a lot of juveniles). This way you can see them with the microscope. In the wild shrimp juveniles are carried away with the water flow into brackish water of river estuaries and the first stage of its growth the juveniles spent in seawater. That’s why it’s important to add some salt into the water where juveniles inhabit (in the freshwater they don’t survive their larvae stage and die on the 4th day of life). Amano shrimp breeding in vitro was considered impossible until recently. 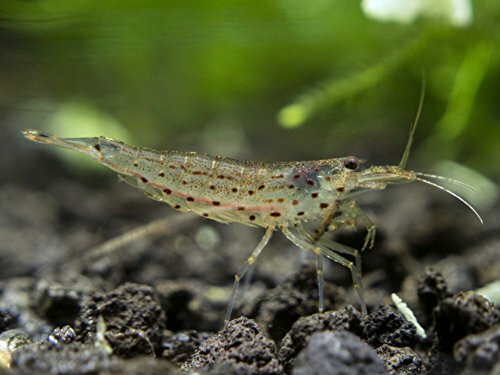 There was some information about its successful breeding, but later it turned out to be some other shrimp similar to Amano one. To achieve success in Amano shrimps breeding you should take the shrimp larvae and then the juveniles through the stages of water salinity, which correspond to their migration trough different kinds of water in the wild. The best results at early stages were achieved at water salinity level from 15 to 20 permille. For this purpose you should use salt for reef tanks. It is recommended to perform reverse decrease of salinity level starting from 35-40 day since the larvae hatching. Complete development cycle of the shrimp takes about 140 days. The exact values and dates of when and what water salinity is needed for shrimp larvae and juveniles very quite significantly and there is no common point in this respect yet. But some aquarists have already achieved rather high survival rates of Amano shrimp larvae and juveniles, that’s why we can assume that soon we’ll have more accurate information about shrimp breeding in vitro.